Jordan’s sister gave me this recipe. Super easy, and the greek yogurt makes the chicken nice and moist. 2. season the chicken with salt and pepper. Brush the chicken with the yogurt and coat with the pistachio mixture, pressing gently to help it adhere. place the chicken on the prepared baking sheet and bake until golden brown and cooked through, 20 to 25 minutes. 3. Meanwhile, heat 1 tbsp oil in a large skillet over medium heat. add the onion and 1/4 tsp each salt and pepper, and cook, stirring occasionally, until tender, 6 to 8 minutes. stir in the cumin and cook for 1 minute. transfer the onion to a medium bowl. add the couscous and toss to combine, add 1 cup tap water, cover and let sit for 20 minutes. 4. heat the remaining tbsp oil in the skillet over medium heat. add the spinach and garlic. A little salt and pepper won’t hurt either. Cook until tender, about 3 -5 minutes. 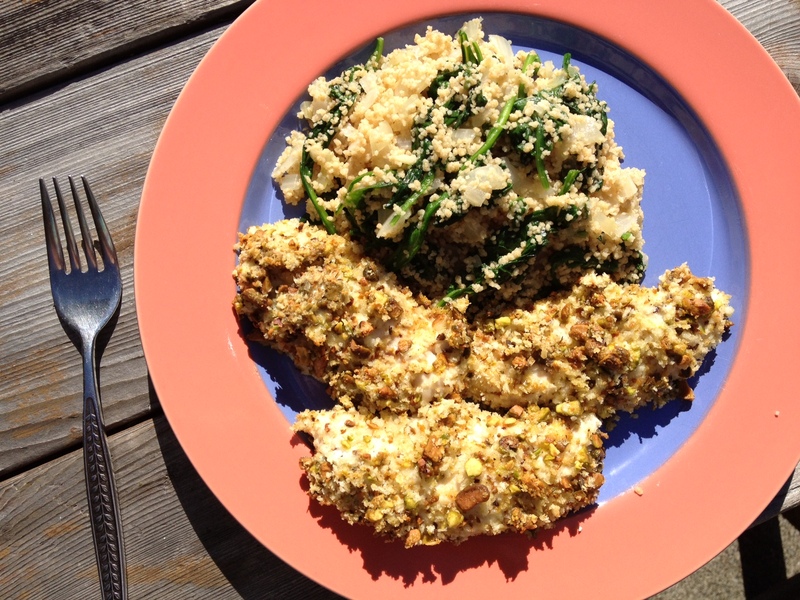 Fluff couscous with a fork and fold in the spinach. Serve with the chicken.